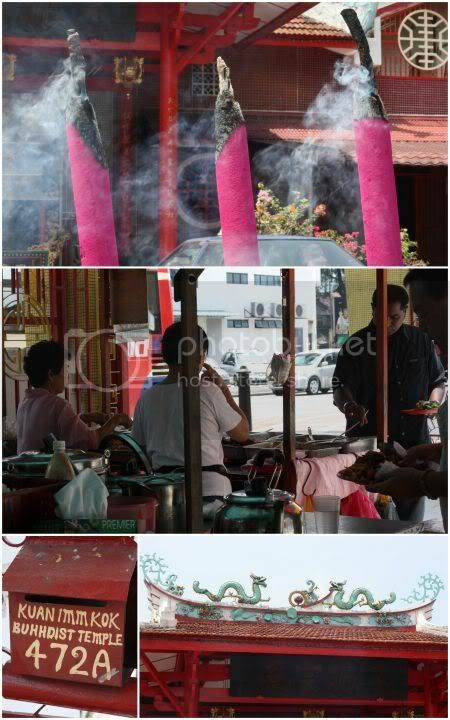 I thought this post should be appropriate after the excesses of the long weekend - some vegetarian food found at one of the most unusual places, a stall located within a Buddhist temple grounds. During my days of working in the culinary-desert land of Damansara Heights, we used to escape to Jalan Ipoh to enjoy yong tau foo at the shack near the river (now moved into the bungalow across), wait for kingdom come at the seafood noodles in Segambut (I used to eat the sambal just to tide my hunger pangs) and this simple stall. I was recently at Jalan Ipoh and decided to revisit old memories by dropping by here. 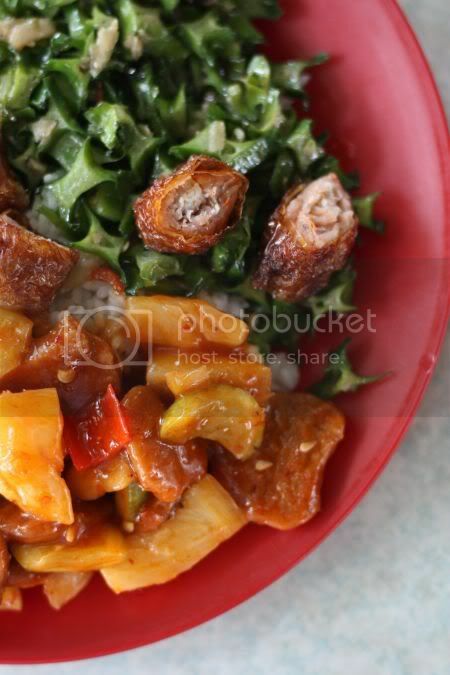 Food is just as good - a mix of simple cooked vegetables or deep fried rolls filled with yambean that you select from a variety of dishes like an economy rice stall. Parking is relatively easy at the temple's big compound and you get tables and chairs under the shade of a big tree. Aside from the dishes you pick, the other alternative is vegetarian fried beehoon - delectable thin strands that often make me crave for more. One wonders what goes into those noodles, as they taste so incredibly yummy. Drop by here, if you're ever in the neighbourhood and discover a simple yet tranquil meal. 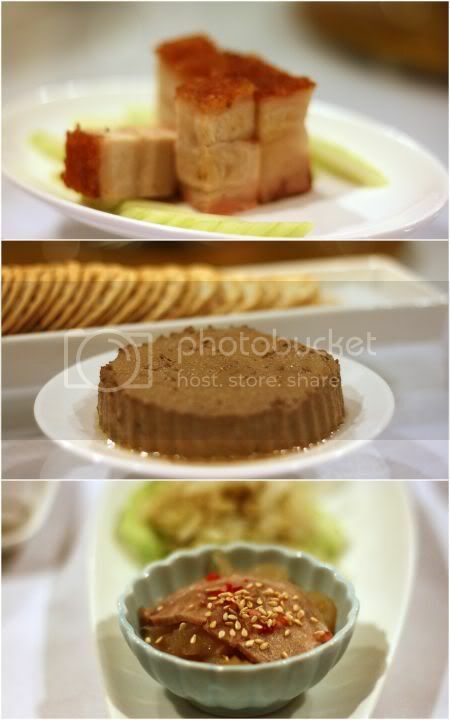 1. crunchy siu yoke, 2. homemade chicken liver pate, 3. 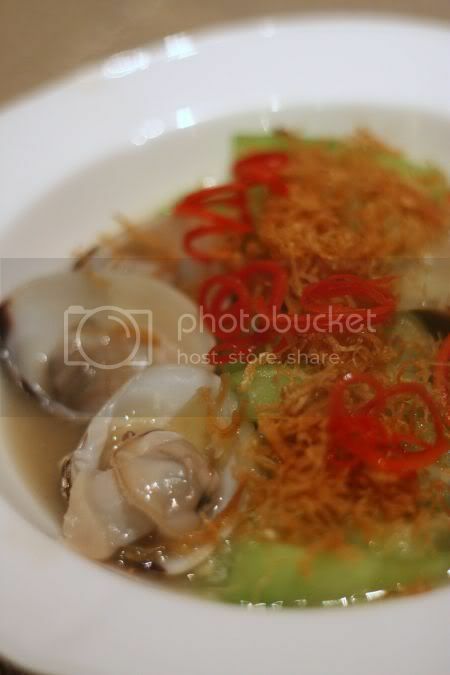 Meet Jerry or Jellyfish hidden in the bowl. As the US will be waking up to the start of the Thanksgiving celebrations, I thought it'll be nice to share my recent Thanksgiving experience in the heart of Kuala Lumpur. We kinda do the celebrations differently in Malaysia but one thing is sure, the gist of the dinner is still the same like a traditional Thanksgiving - to give thanks and express gratitude. This time round, the Chans were doing the honours for friends who have supported their restaurant, Chef Choi at Jalan Ampang. It was indeed a privilege to be invited for the dinner, where I managed to meet new friends who are also fellow foodies and catch up with old ones too. Unlike the typical sit down Thanksgiving meals with a roast turkey, the sides and a pie, this was by far the most unusual variation I have eaten. Literally an east-meets-west version, we started off with some crunchy siu yoke as a starter and the restaurant's own-made chicken liver pate with some crackers. Once everyone gathered, it was time to meet Jerry! Since the menu had mentioned a "jerry fish" we were all curious on what new specimen it will be. Turns out he's just a crunchy bouncy jelly fish thus named because they messed up the spelling. Anyway, dear Jerry was out for a surprise, since Tom the turkey (his old nemesis from the ever famous cartoon) was just two courses away. We even managed to get a taste of the hairy crabs - incredibly decadent creamy technicolour orange roe that you scoop up and relish. 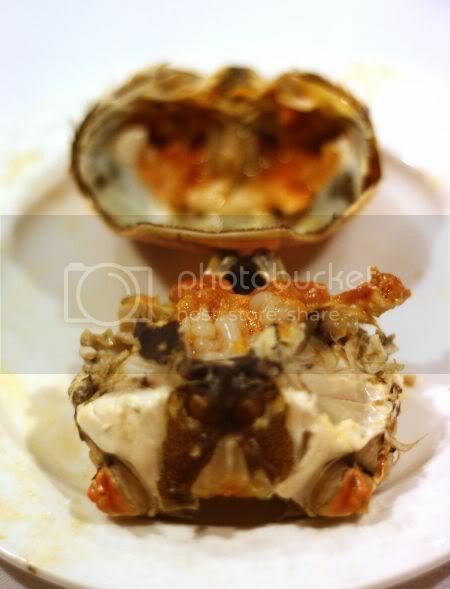 Once you have devoured the richness, it was time to slowly enjoy the sweet crab flesh within. Usually people only eat the roe but due to the crazy prices for these fluff covered crustaceans, we also eat the sweet tasting crabmeat rather than throw it away. After enjoying the crabs, a must is the hot ginger tea to get rid of any "wind" from consuming the crabs. I loved the strong hot ginger tea served to us and could have just drank that the whole night if I had an option. Next it was a prawn bisque followed by the main star of the dinner - Tom the Turkey and his co-stars: divine stuffing, sausages, roast potatoes, salad and sweet peas cooked in a garlicky sauce I couldn't stop eating! Served on platters and placed on the glass turntable, there was an air of communal sharing (kinda reminds me of Chinese New Year!) with everyone helping themselves. 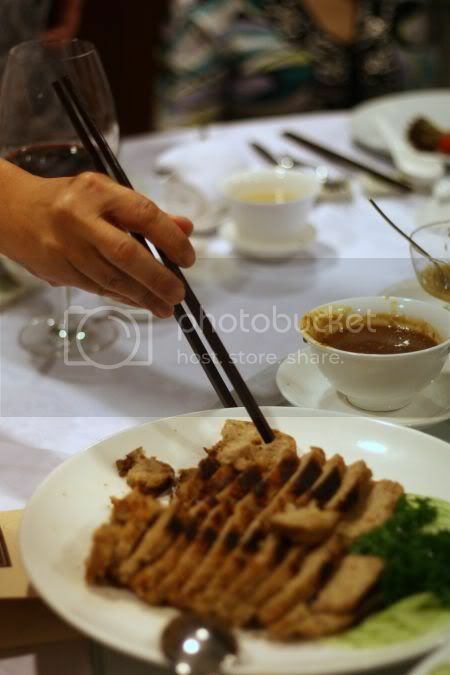 While forks and knives were available, some were even using chopsticks to pick the food. In fact, I ate my turkey dinner with chopsticks!! 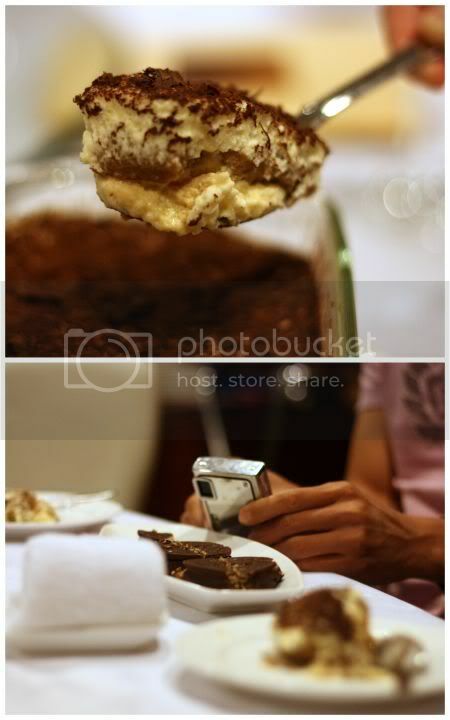 Last but not least, we wrapped up with dessert - Chef Choi's signature tiramisu that is light and fluffy. The secret we discovered to its incredible lightness - only beaten egg whites are folded in and there's no mascarpone cream. Simply gorgeous! As another treat, Alfajores (chocolate sandwich cookies with a dulce de leche centre) all the way from Argentina was shared by my friend S, who had just visited the place a few weeks back. She gave me a stash too and I have been slowly savouring them as they're incredibly good. Thanks so much to the Chans for the invitation! Happy Thanksgiving everyone! Time for some old fashioned goodies and a little sprinkling of Hakka heartiness. My late father was an ultimate foodie in my eyes. Whether it was his love for down-to-earth Hakka dishes that he grew up with in his large family of 13 siblings or high flaunting French food in Lafite, he wouldn't mind spending on the family to make sure we all ate well. Every new country he visited, the first thing he'll do would be visit their wet market as that's where he'll discover the soul of their food, touching the ingredients and just absorbing the smells. Yap Chong would have been a place my dad would have approved since they serve traditional Hakka dishes like char yoke and kaw yoke that he loved. While my mother always frowned on these dishes (too much fat and so unhealthy! ), no matter how much she controlled my dad's diet he always managed to get his fair share of these dishes some how some where. Started in 1966 by Yap Chong (hence the name of the restaurant), the establishment is now run by his grandsons who continue their grandfather's legacy. 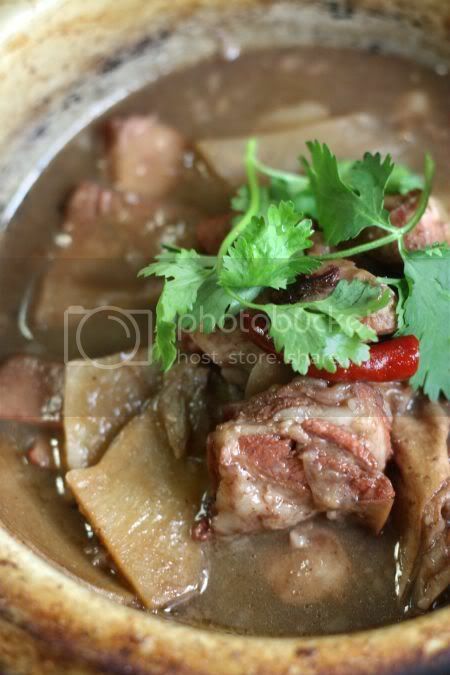 Old school items like the char yoke or braised pork is actually based on a recipe passed down through time. 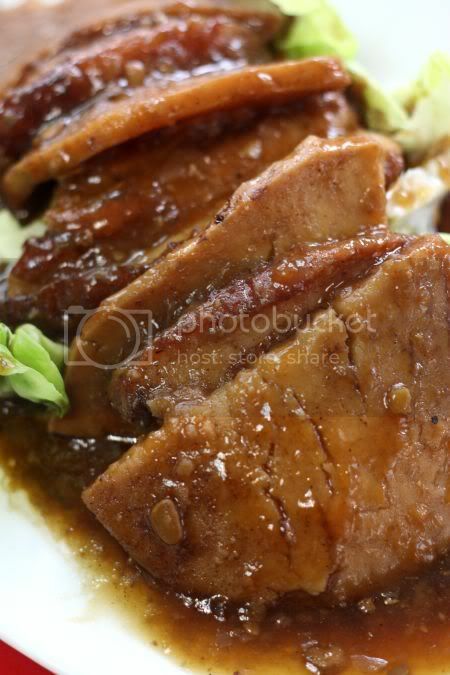 Here pork belly slices are lightly battered with a good balance of nam yue (fermented bean curd) used in the gravy. 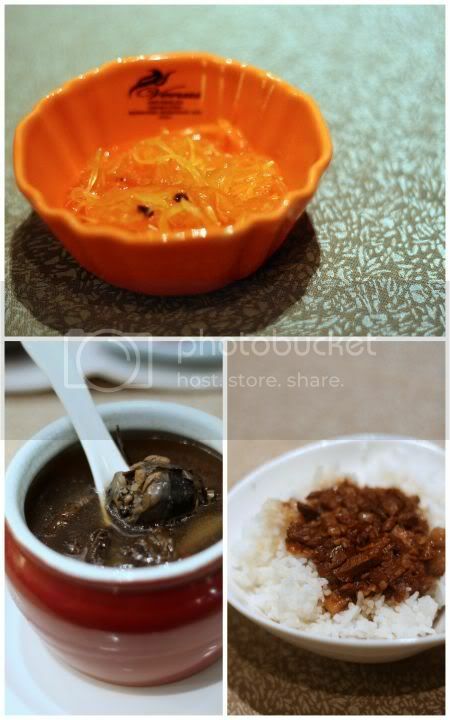 Simply very comforting food that I could have just eaten for a few days, especially with a bowl of white rice. One can also imagine my aunties and uncles tucking in these kind of simple meals during their childhood. The kaw yoke - belly pork slices with yam had that decadent feel in the mouth (a combination of melt-in-the-mouth fats and meats) but was missing a much needed addition of five spice powder in the sauce. Instead, they seemed to have added that much needed sprinkling of five spice powder in the claypot mutton dish, since the spices were just way too overpowering. Steamed fish is also a specialty here and the restaurant keeps their fishes in containers for a few days to get rid of the muddy taste. 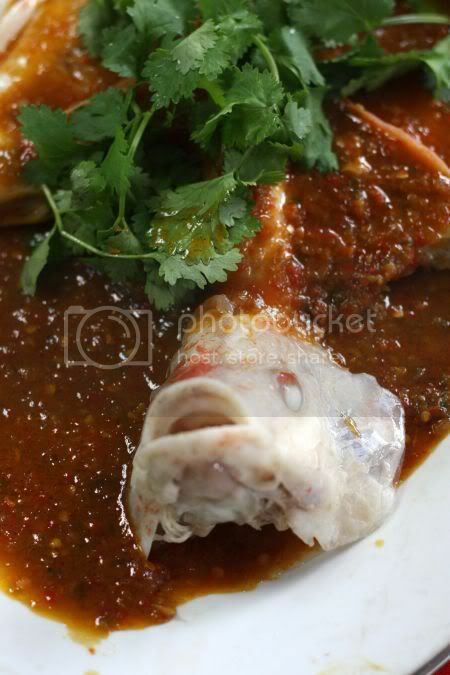 While no mud smell was evident in the perfectly steamed fish, I did feel the cheong cheng sauce was also a little imbalanced - more soy bean paste and not enough kick from the chillies added. 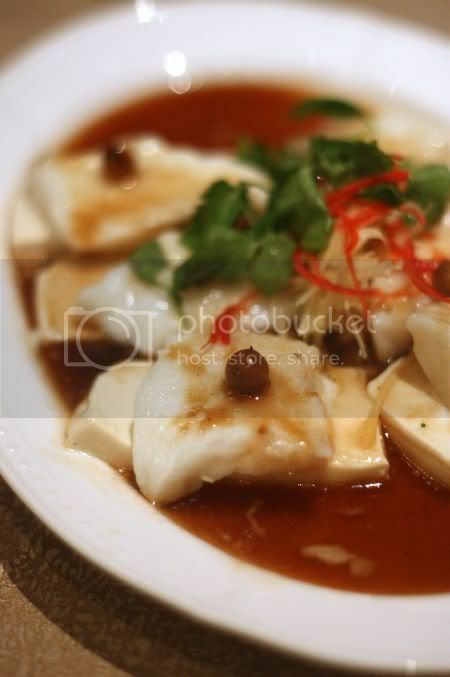 Definitely can't beat the ultimate steamed fish cheong cheng that we discovered in Fock Kee, which is nearby this place. 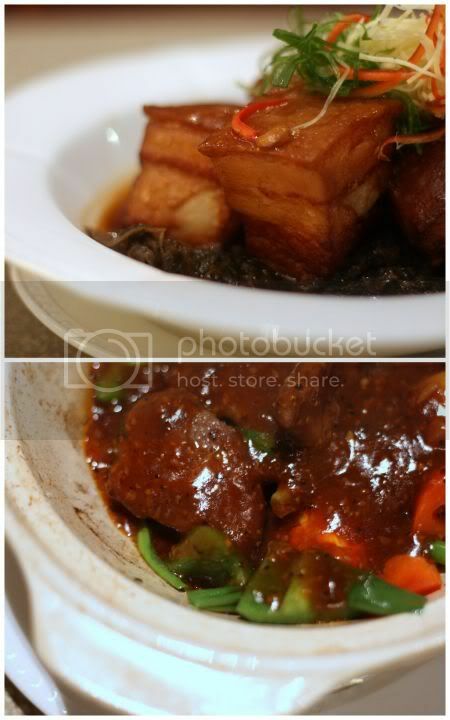 There the sauce is just perfect with the right blend and a sinful twist of fried lard pieces. Last week, we got embroiled in something pleasant (even though it was a threat to the waistline) - giving feedback to Delicious on their proposed menu items. They're in the midst of revamping the menu and prior to unrolling out their newbies, it goes through a few road tests - among their own chefs, their family members and also tasters from the general public. We were privileged to get an invite (thanks to PL! ), as among our group there were friends of the management and regular diners to all their outlets. We also sat among a group of fun loving individuals that kept us entertained the whole night, making it a great pleasure even though we were technically "working"! Taste testing 25 items ranging from breakfast, salads, Asian items, desserts and drinks was pretty serious business. After every tasting session, we had to give feedback on the taste and the visual appearance. Needless to say, we were as honest as we can regarding every dish that passed through our mouths. Am not sure what will be the final outcome but we will wait with bated breath. One of the items we tasted, inspired me to whip this dish last weekend. It's more of a variation since this is more homemade but it was just as delish with the truffle oil that adds a luxe taste to it. Preheat an oven to 220 degrees Celsius. Cut the potato into wedges. Toss in some oil and bake in the preheated oven for about 30-45 minutes or until browned around the edges. You may need to turn the wedges halfway through the cooking time. Remove from the oven. 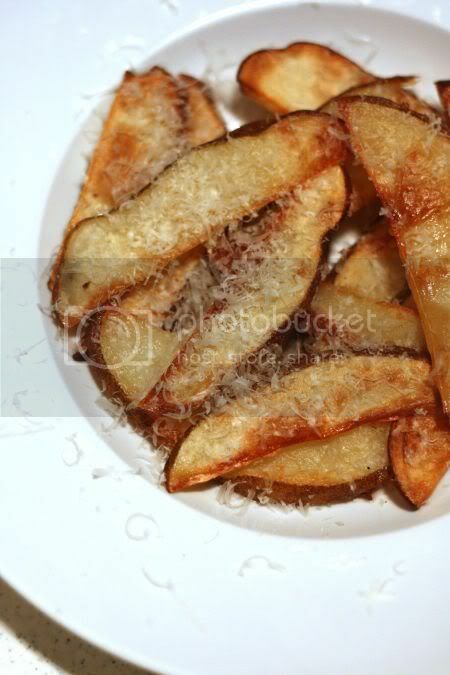 Finely grate parmesan cheese and drizzle with a dash of truffle oil. The wedges get their heady aroma from the truffle oil. Serve and eat immediately. When I first read Sean's review of High Tide, I was appalled with the prices (RM48 for a salad with no seafood!). Ouch! That will definitely burn a huge hole in the pocket especially if I wanted to sample more items here for a good review, that I shoved the idea of dining here for about 2 months. Then a week back, a chef I knew raved about the place so much that I knew I should make an effort to sample the food prepared by Belgian chef Evert Onderbeke, who had trained under a 2-star Michelin chef, Roger Souvereyns. Luck was on my side as I called up and discovered they're doing lunch specials (2 courses for RM75++ and 3 courses for RM95++) from Tuesdays to Saturdays (they're closed on Mondays). It sounded good and definitely more affordable for us especially since we both wanted to sample the food first before forking out more monies. 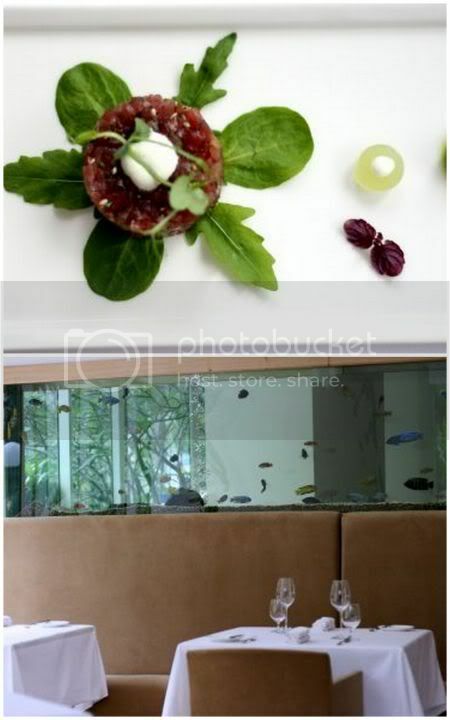 The place is very comfortable with plush brown seats and crisp dot linen on the tables. Keeping with the aquatic theme, aquariums filled with colourful fish dotting around their watery home surround the diners. Its dining area is not too large, probably about 10-15 tables giving it a pretty cosy feel. Light pours in from the tall unadorned glass windows on the side. The kitchen is kept hidden behind glass walls sandblasted to offer some privacy for the chef except for a tiny window at the bottom for service. Service was impeccable, helmed by their French restaurant manager, Carole Pinel who kept us well informed about our dishes. We were the only diners there hence we also enjoyed their undivided attention. Not many people know of this place even though it opened 2 months ago but they have been getting diners through word of mouth recommendations. Plans to advertise are in the works soon, hence hopefully people will start recognising this little gem of a restaurant. Feeling decadent, we went for a platter of oysters to accompany our set lunch. 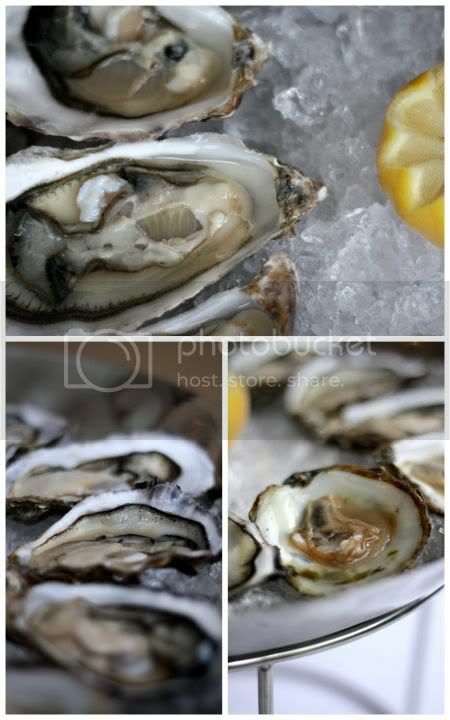 There are three varieties available - Belon, Fin De Claire and Irish or Pacific oysters. We decided to give all types a taste run and ordered an assorted platter (RM135 for 12 oysters). Oysters were very good (but weirdly enough, still not as fantastic compared to the Canadian ones we had at Sage!) 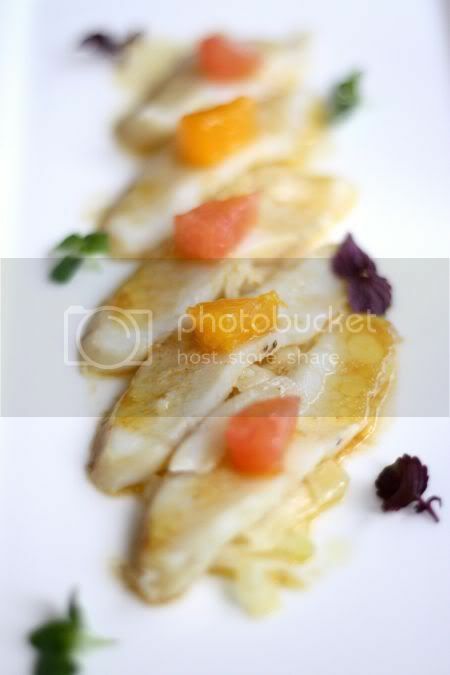 - fresh, creamy with a briny taste of the sea especially eaten plain with a squeeze of lemon juice. Gorgeous! Our favourite was the Belon with its briny mineral taste while the Fin de Claire and Irish ones were more creamier. Our food just kept coming in, we actually started off with the chef's amuse bouche, salmon tartare, parmesan crusted seafood and a potato and spinach soup with mushroom foam. 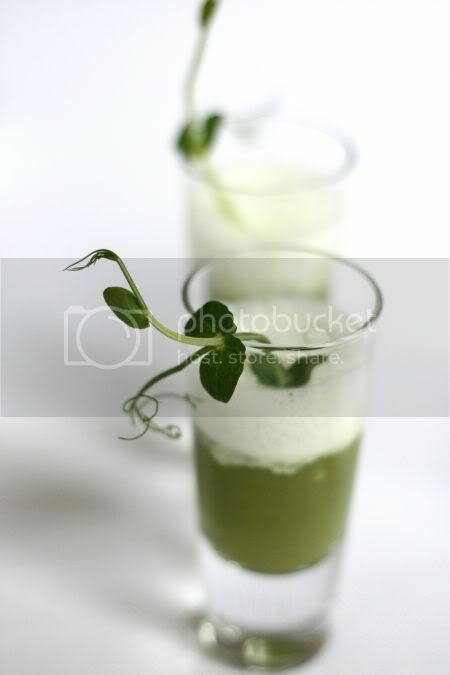 The soup served in a shooter glass was excellent and so pretty with the pea shoots. Then it was our starters for the set lunch: a gorgeous tuna tartar arranged like a flower for him that looked almost too pretty to eat and a smoked monkfish for me. 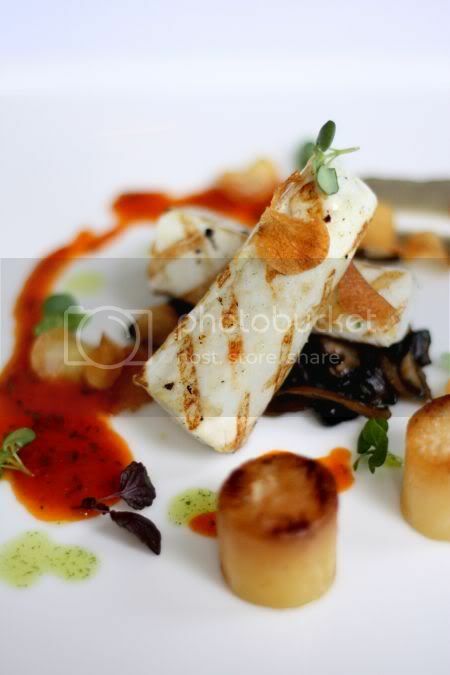 Plating here is reminscent of the landscapes, Michel Bras is famous for making us go Aaah! at every plate we were presented with. 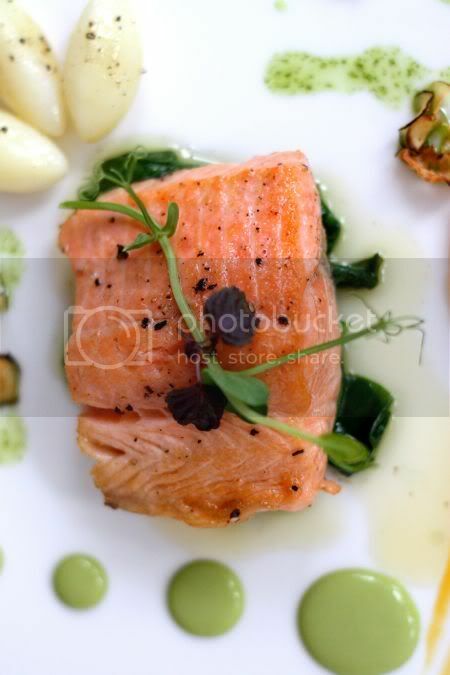 Mains was a choice of ocean trout or king fish, we don't usually see on our Malaysian tables. Both fishes were cooked to perfection and incredibly good when paired with their side sauces, pumpkin for the ocean trout and a mix of roasted eggplant and tomato for the kingfish. We end with dessert - a decadent chocolate bar served with mango ice cream and a pretty ordinary tasting strawberry bavarois for me served with a milk sorbet. 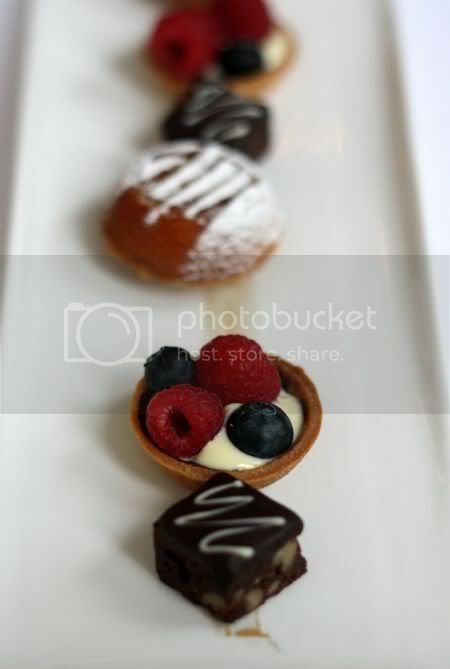 At the end of the meal, we were also presented a selection of petit fours (more desserts!) - a chocolate and nut square, fruit tart (I love the sweet raspberries and blueberries) and my favourite, this almond and apple cake. 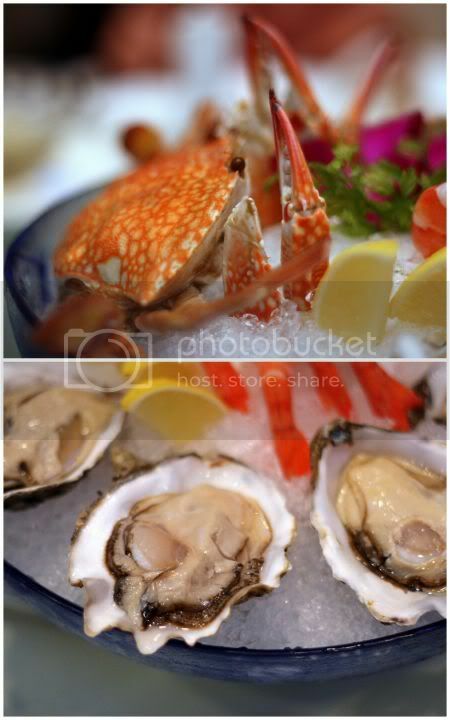 Ingredients are top-notch with the seafood flown in from Europe, Japan and etc almost on a daily basis hence the hefty prices that reflect the top quality of the ingredients. Depending on what they get, they will recommend you the daily fish specials. Menu items may also change due to availability of items, hence it is best to check ahead what they have. 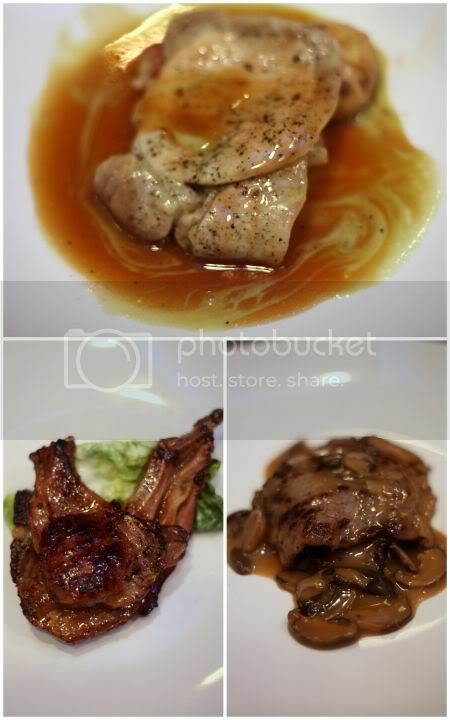 Prices are RM48 for the salads, starters are around RM98, mains are around RM98 onwards. They do a seafood platter with oysters, lobster, mussels, langoustine, prawns, clams to share between two diners or more, that costs RM248 per person. For both of us, we definitely will return for the menu items and dinner again (just have to wait for the moo-lah first! ), as we both loved the food. For more pictures, see my Flickr set. Let's end the week with a little community service announcement aka Subang Teow Chew Claypot has now shifted from their ramshackle shed into a proper shophouse. 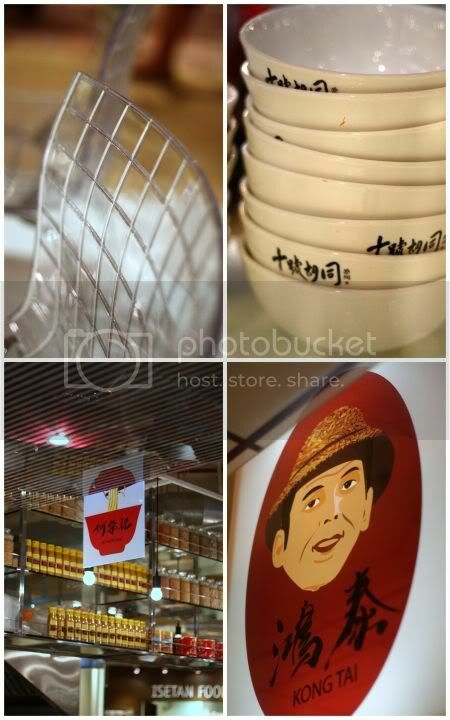 They now join a legion of bak kut teh shops (at last count 3 bak kut teh shops). It's just a hop and a skip away from their old place, since it's just at the shophouses just off the right hand turn (coming from Shah Alam) at the traffic light. 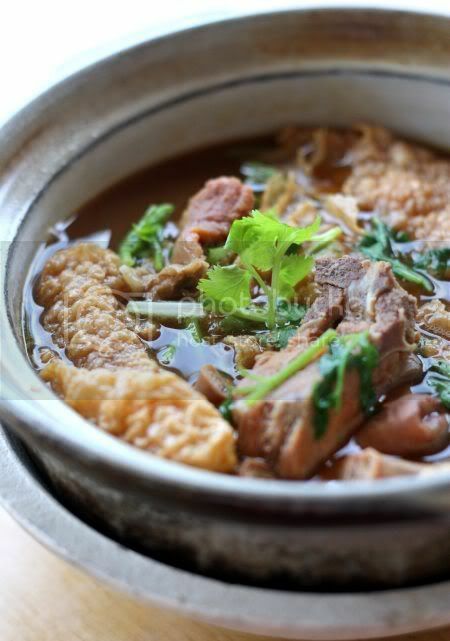 Unlike the other bak kut teh places nearer to the main road, Subang Teow Chew is tucked well within the shophouses and nearer to Big Plate. Located at a corner shop, parking is relatively easy and the place feels a little less packed compared to the previous location. 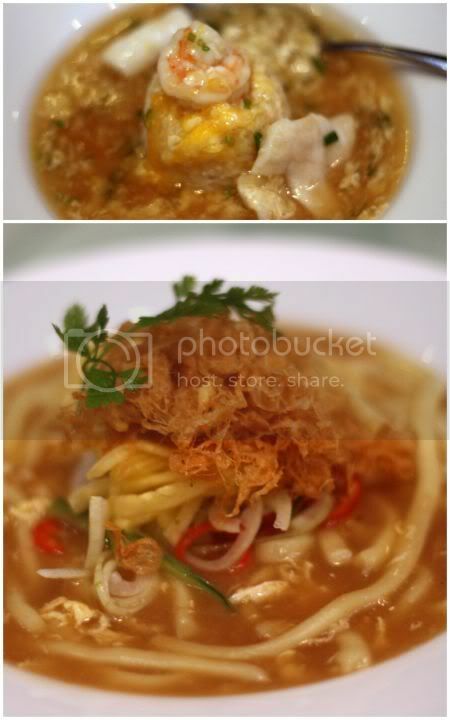 Tastewise, it was still the same, a nice light brown herbal tinged broth that will keep your tummy warm during these rainy days. 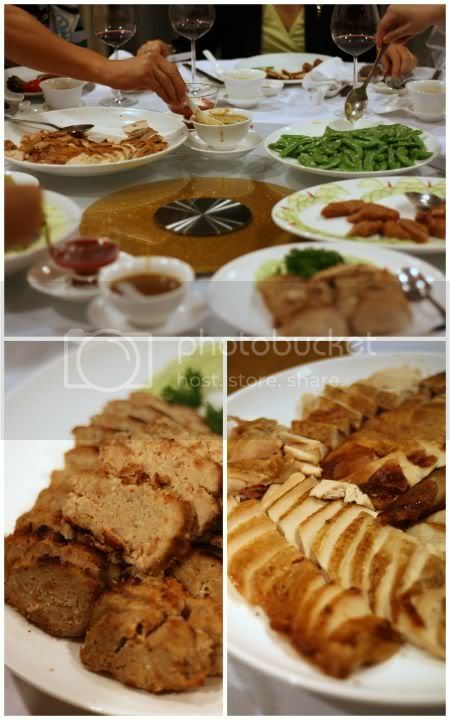 Unlike the other bak kut teh shops, they offer quite a lot of variety serving up tofu, fish and vegetable dishes also. I first heard about Patisserie Rui from my friend S after her colleague bought cupcakes for her office meeting. Then it caught my interest again, when I saw Panora magazine (those free Japanese papers you pick from the supermarkets) had listed their white chocolate cheesecake. While my curiosity was perked about this place, getting down to trying their cakes became quite a trial. First, spotting them along the white long stretch of shops along Mont Kiara Meridin was difficult - they seemed to be overwhelmed by signs of Hiestand, Dominos, Satay Station and etc. No signboard except a small sign on their glass window didn't help for people who'll drive past this place from Mont Kiara to Solaris on the busy Jalan Kiara road. The few times I was at Solaris, when I wanted to drop by, the place was closed (it closes on Sunday). Once I sussed that out, I was too late for cakes (I dropped by on a Saturday in the evening). Finally, we got our act together and managed to drop by after maybe our fourth attempt to visit this place. Bear in mind this place is tiny with just two tables and chairs to sit outside under a canopy. There's also very very limited seats within the place, as it seems to be more of a workplace for the cakes. Nevertheless it's quite pleasant sitting outside with the flowers in the boxes since it was a rainy day. However, if it is a sunny day, I doubt the dust from the passing by vehicles may make it so pleasant. Thus, my advice is buy back the cakes to enjoy in the comfort of your home. 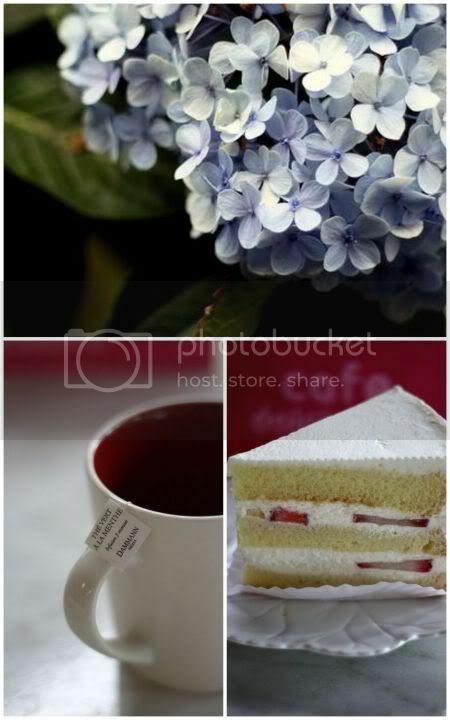 They serve Illy coffee and Dammann Freres tea (owned by Illy) hence you can enjoy good coffee and tea with your cakes. Back to the cakes, there was a selection of strawberry shortcake, tiramisu, a princess cake and the cupcakes. As the princess cake was sold whole, we decided to give that a miss. The lady also advised they have cookies. Didn't see the cheesecake at all, except two pieces within the chiller that looked like they were left over from Saturday, hence I avoided that. The cakes strike me as very Japanese ( we saw a bevy of Japanese housewives buying cake here too!) as the texture of the sponge layers in the tiramisu and the strawberry shortcake was very light. The crumb is not as fine compared to those made from a sponge cake mix and it feels a little more sweeter and crumbly. The strawberry shortcake (RM9 per slice) was a nice and light confection and to be honest you didn't even taste the strawberries nestled within. 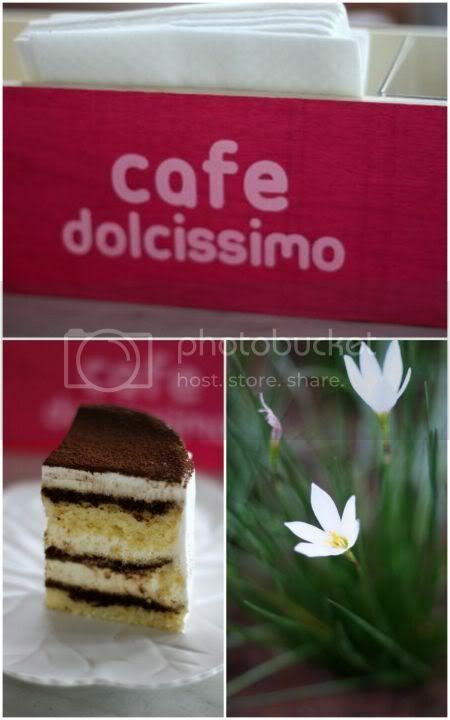 We fared better with the tiramisu (RM4.50 a slice, RM18 for a small whole cake) since the coffee layer was stronger. These kind of cakes will definitely appeal to those who prefer light cakes (less guilty I guess for them!) for a dessert interlude that is not heavily flavoured. For those who prefer more stronger flavours, do avoid this place (my friend who had the cakes here a few times, didn't quite like them calling the cakes tasteless and bland!). 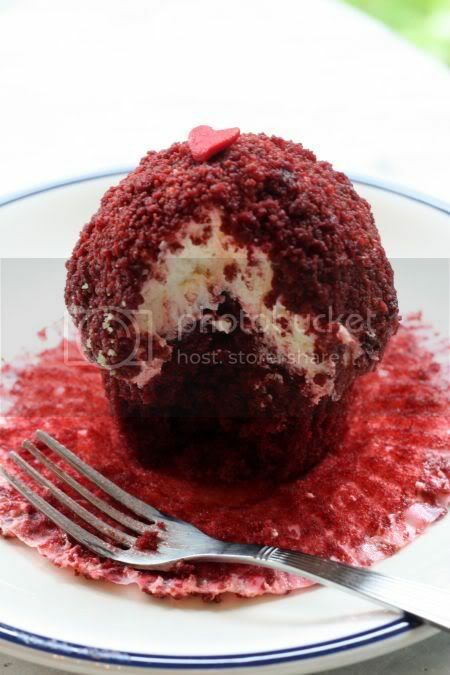 For the cupcakes (RM3.50 each), they mound sweet whipped cream on top of the cake and sprinkle crumbled cake to cover the cream giving it an appearance like a fluffy snowball. We tried all four flavours and concluded: red velvet was just more the red colouring since tastewise it was bland and uninteresting, the green tea (had oxidized hence the unattractive brownish green colour) tasted a little weird like it didn't have enough green tea powder to give it a distinct flavour, the lemon was our favourite with a moist lemony but not sharp taste to it and chocolate that was rich and dark looking but didn't have a very distinct chocolate taste. The crumb of the cake is also quite fine and almost like a muffin. The sweetened whipped cream topping appealed to some (my mother hated it saying too sweet) while Splashie Boy loved it. It will be interesting to try their other creations especially the much raved about cheesecake but the organisation of the place can be quite chaotic. The lady who served us the other day was very nice about it and even gave us a free cupcake since she knew we came a second time to get the cakes. Best you call ahead and enquire the availablity of the cakes, since they seem to bake them in batches. Some of their cakes like the tiramisu and princess cake are tiny (probably about 2 inch diameter round) that makes it good for a small celebration for two to four people. For more pictures, see my Flickr set. A quick one for today, something to cheer up today. Seems to be such a double-edged sword today - it's Friday meaning the end of the work week BUT today is the thirteenth! Hope nothing bad happens to me or you, today and the Friday passes like a breeze. Today, I decided to highlight one of favourite ways to beat the heat. The weather nowadays is as usual a little crazy - super hot in the afternoons and then rain in the evenings. For me, my favourite way of relaxing on a Sunday hot afternoon is the mango lolo at KTZ, SS2. 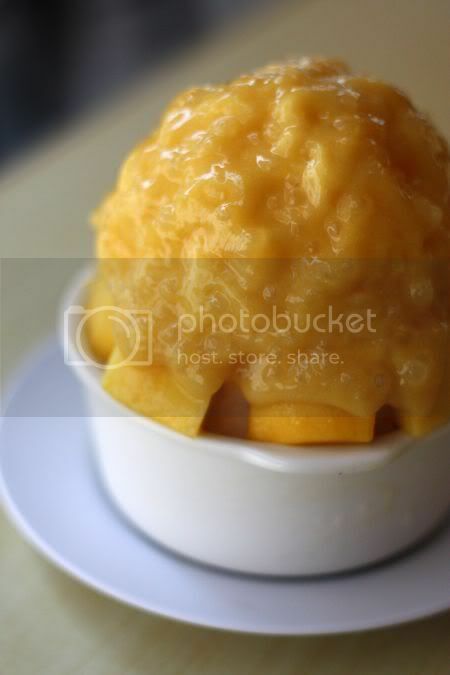 Packed with blended fresh mangos with sago pearls and mango cubes, this tops a mountain of shaved ice. 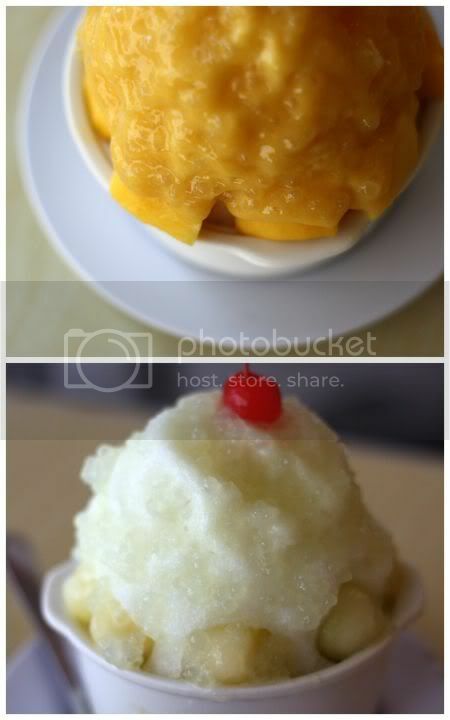 Slowly eat it from the side to enjoy the sweet mango taste with the icy cold shaved ice. Yums! Splashie Boy prefers the honeydew version (he does love his honeydew!) but give me the mango version anytime. One can understand why KTZ does such booming business, as the food is excellent there (love their fried rice) and these mango lolos - prepare to wait a very very long time especially the night time (we once did and was counting the number of lolos emerging from the dessert counter!). 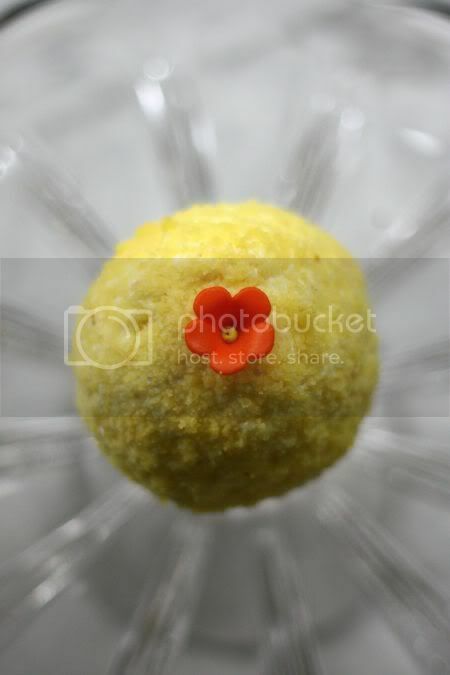 Strawberry, kiwifruit, redbean, mixed fruit lolos are also available. So what's your favourite way to beat the heat? 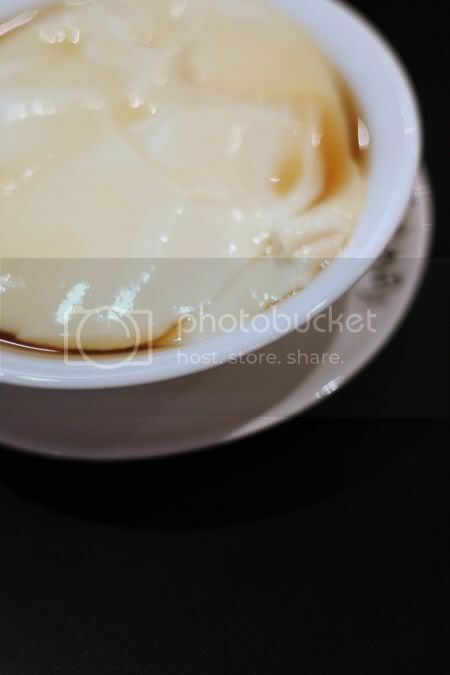 Cendol, Ais kacang or just something simple whipped at home? I'm always a fan of Taiwanese food since to my tastebuds, it's very similar to Chinese food but with an edge that makes it also very distinctively different. While I've never travelled to Taiwan, my yardstick on Taiwanese food has been Formosa Restaurant in SS2 (a place I grew up with) and in recent years, Fong Lye - a place we regularly dine. Thus I was excited to read from Eat Drink KL's blog (the go-to blog for new places to try) about this new place at Soho KL, opened by the same owners of Michelangelo's. A quick word with the very friendly captain revealed this place did open for a very short time in Sunway Pyramid but relocated here. The chef is from Taiwan and it seems even the ingredients are imported from Taiwan to keep it as authentic as possible. Unfortunately two subsequent visits to this place yielded one general response - if you're on a lookout for Chinese food presented in a more refined way then this place is great BUT if you're seeking extraordinary Taiwanese food with the wonderful aromas and flavours like I've experienced in Fong Lye, then sadly you won't find it here. 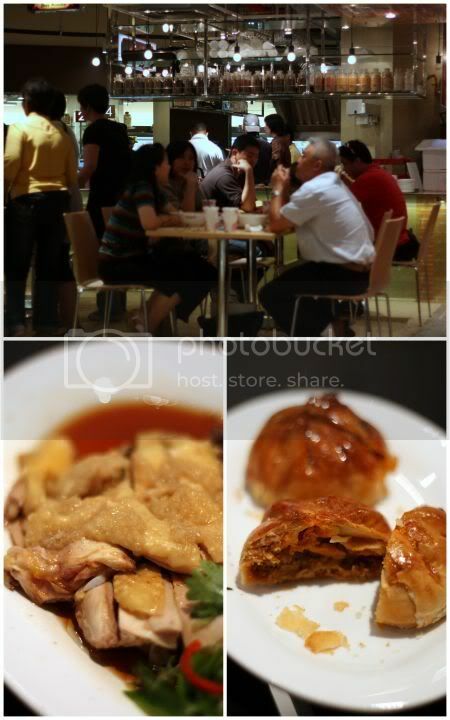 Chiefly the place failed the sanbei kai or 3 cup chicken test in terms of Taiwan authenticity i.e. 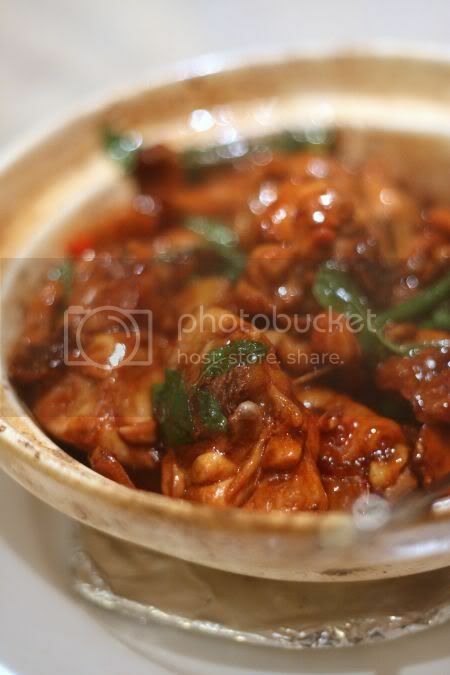 an utter lack of the heady aromas you get when the waiter opens the claypot lid, as the chicken sizzles in a sauce made from soy sauce and rice wine, mixed with fresh basil leaves with sliced ginger. 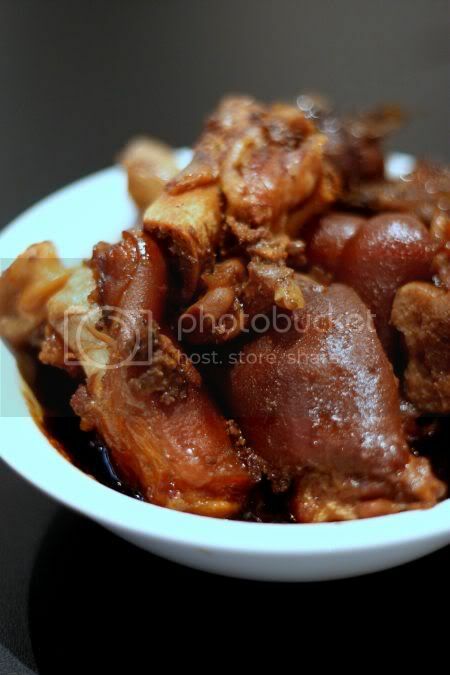 Instead, the dish fizzled out to be just an ordinary braised soy sauce chicken. We reckon they must have adapted this dish for the locals as usually the authentic ones is a little drier while their version has more sauce. 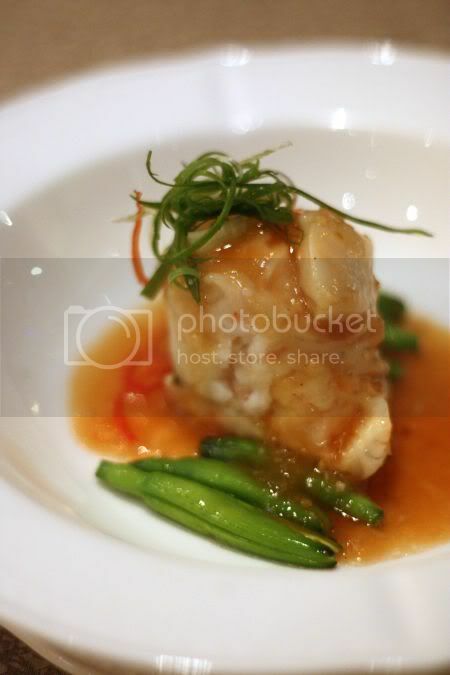 That's not to say we didn't enjoy our other dishes, as the steamed cod served with beancurd was beautifully executed with silky smooth beancurd with the Taiwanese cordia seeds to give you a burst of saltiness to an otherwise quite bland tasting dish. Another favorite was the sinful pork belly slices that crumble into the mouth when bitten in paired with Taiwanese mui choy that is not overly salted. 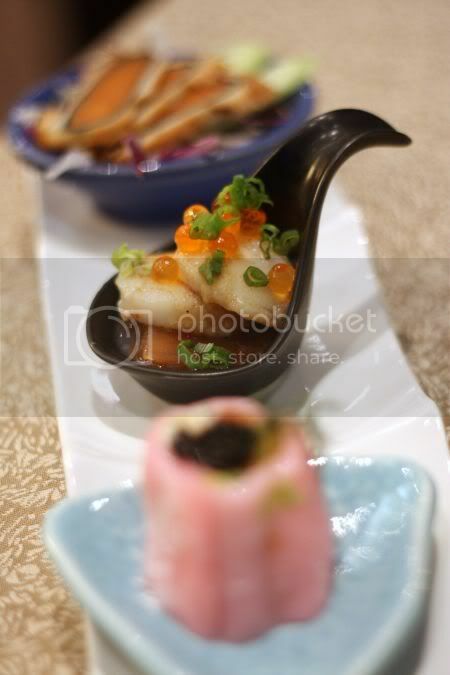 This place serves some unusual dishes like the appetisers - a soft yet slightly chewy mochi filled with foie gras and vegetables, the mullet roe and scallops served with a tangy sauce and ikura. My favourite was the mullet roe that reminded me a little of salted egg yolk but less of a saltier edge. Savour each slice slowly with the raw leek thinly sliced to balance out the salty taste. My only complaint about the mochi roll would be it was a shame to use foie gras that way though since you don't really taste it within the roll in one bite. Some dishes are beautifully presented like the prawns with mayonnaise, served in passionfruit "cups" as the mayonnaise coated prawns are lightly tossed with a passionfruit sauce. 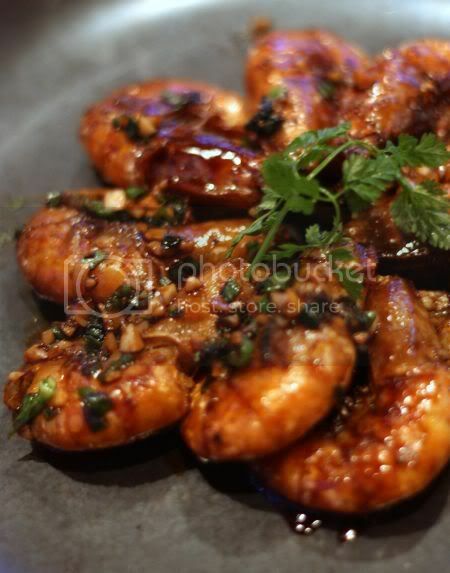 That combination made the prawns less overwhelming creamy and easy to munch down. 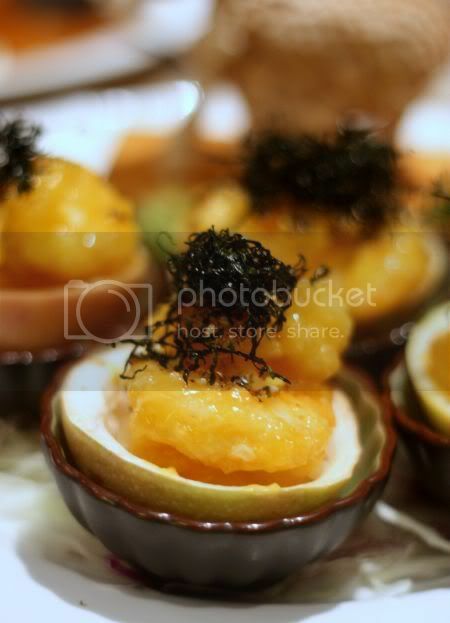 Topping each golden prawn was shredded seaweed, while at the bottom of each "cup" was canned pineapple. Other dishes we also tried that didn't wow the tastebuds was the loofah (not too old) topped with crispy scallops and clams , the black chicken soup with lotus root, US short ribs with black pepper sauce and the fish roll with prawn paste. One problem I noticed that they had was when the food arrived on the table, it's more of a tepid temperature vs a nice hot one I prefer. If the service is a little more slower, I can imagine more complaints coming. 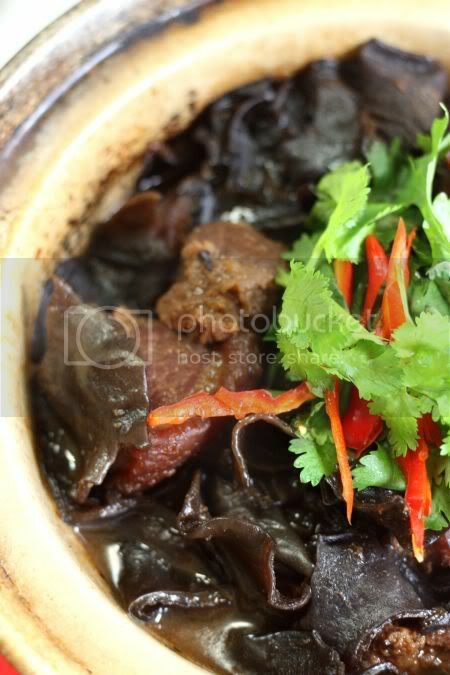 However, if you're eating the sizzling items like the US short ribs or the san bei kai, you don't need to worry, as they come piping hot to the table. 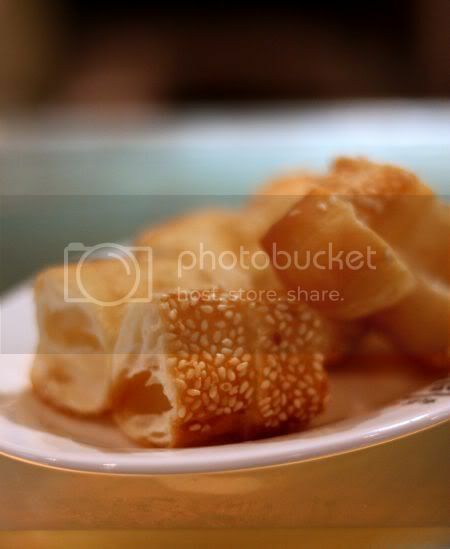 The menu also features dim sum (available even at night) that looks very similar to their Chinese cousins. 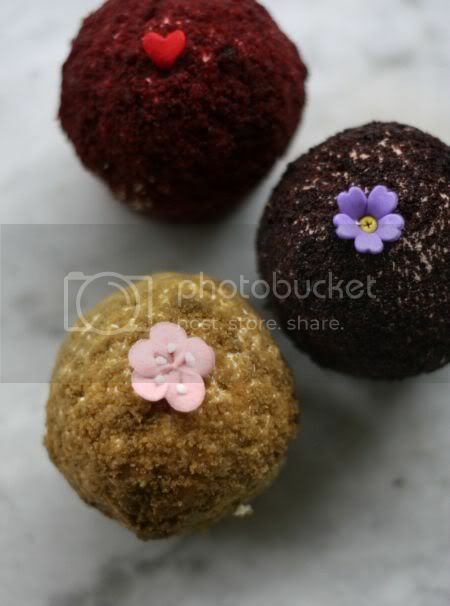 Some are given luxe touches and touched with sliced truffles. 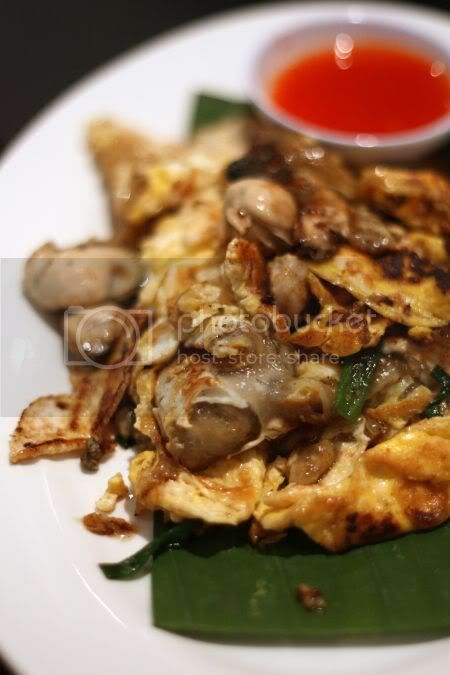 Citibank is also running a promotion for their cardholders - 50% for selected dishes like wok fried scrambled egg with shark's fin, abalone dishes for lunchtime until 3pm from Mondays to Fridays. Good chance for one to sample the more pricier dishes. More details are found in the Star newspaper article. Full set of pictures can be found in the flickr set. Gu Yue Tien is fast becoming a family favourite of ours. Ever since my luxe steamboat experience there, we have been back twice for dinner. My mother - the one with the very discerning and sophisticated palate (she often eats at Hua Ting, Lei Garden in Singapore, Beijing, London and etc) loves this place and no matter, where we go we end up comparing to this place. What we also like about Gu Yue Tien is, it's just not all about luxe items and unusual flavour pairings, as we were also very impressed with the traditional Chinese and simpler dishes like poached prawns (very fresh) or the pan fried prawns (similar to kon cheen har) - a delectable and toothsome dish served with an aromatic soy sauce. Even plain vegetables were well cooked with very little oil, something my family loves. Hence, when my friend asked me to sample their new set dinners, I didn't hesitate and joined them for dinner on a stormy night. It was a set dinner the waiter had earlier recommended to us the last time we dined here (the kobe beef is so good!). Ever since then, I've been thinking of returning to try that set since the portions are served Western-style like a tasting menu making it ideal for the 2 of us. 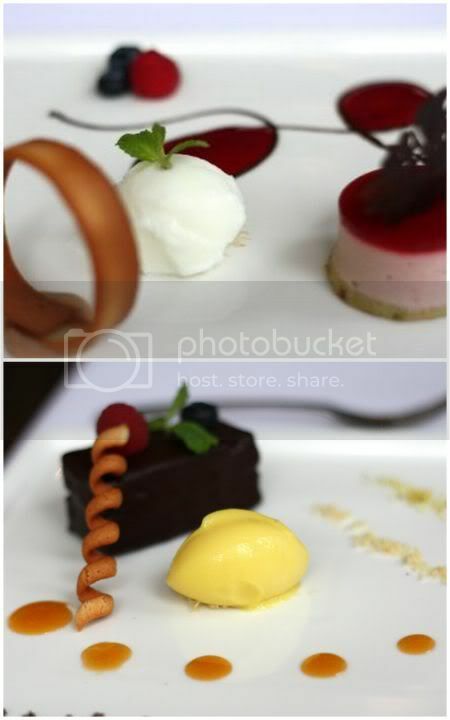 We sampled two sets that night - a 7-course set priced at RM99++ per person (minimum order of 2 persons) and a 6-course set priced at RM268++ for 4 persons. 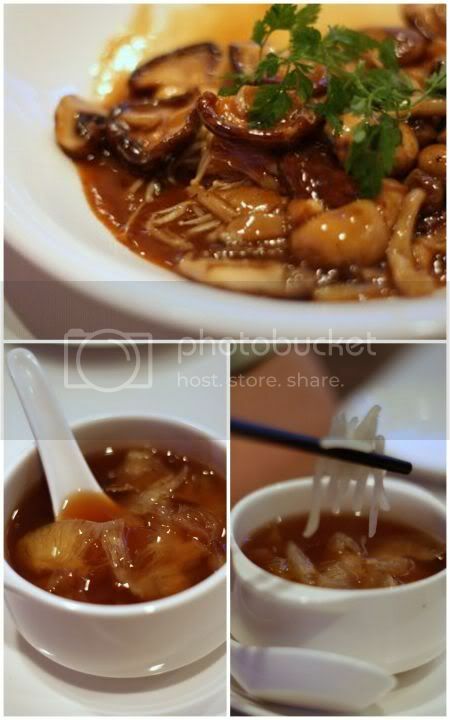 The seven course meal consisted of a cold dish, hot combination, shark's fin soup, seafood, meat, rice/noodles and dessert. Portions are individually sized and more generous than Western-like tasting menu. You get a choice of three items for each course - a great way to hook you in to coming back a few more times to try all the various dishes, as most of them are equally good. We kick off with the cold seafood platter from the 4-person set of RM268++, where you are served a combination of large Pacific oysters, prawns and cold crab to be eaten with black vinegar or soy sauce mixed with wasabi. Everything is super fresh and my favourite is the sweet crab meat eaten just on its own or dipped with just a smidgeon of black vinegar for an extra tangy taste. Nothing prepared us for the rollercoaster of flavours that assaulted us next, as each course came out for the RM99++ per person set. 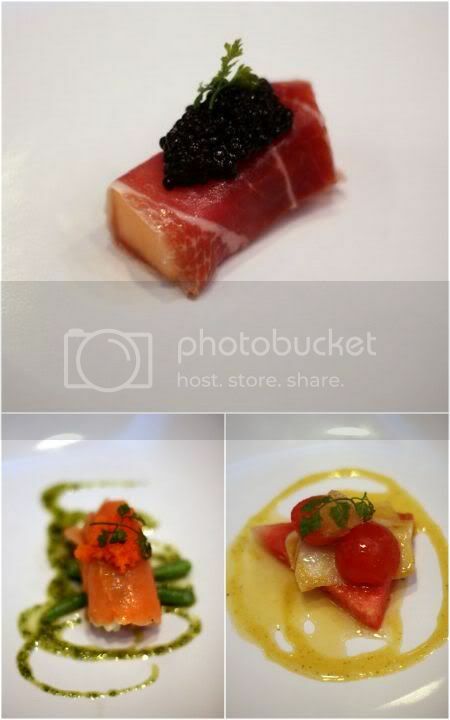 I loved the combination of the Iberico ham wrapped around a sweet and juicy rock melon topped with a generous dollop of Avruga caviar. Equally good was the smoked salmon wrapped around onion crab meat and drizzled with a sweet basil sauce. My favourite out of all the three items - the tangy and slightly spicy pairing of a kumquat sauce (a combination of kumquat, bunga kantan or ginger flowers with bird's eye chillies) with a slice of the giant clam, cherry tomato and watermelon. Starting the meal with that is so ideal, since the tangy taste kicks in the appetite for you to finish off the 6 courses that follow. The hot combination course is just as exciting that it was so hard to choose which was my favourite. I loved the crispy oyster with the tangy sweet potato and chilli salsa and vinegar sauce. We were playing a guessing game on what was used to make the sauce with suggestions like reduced balsamic vinegar and etc. Gu Yu Tien's owner, Frankie stumped us with his revelation, it was Teochew braised sauce known as loh sooi mixed with Chinese black vinegar and reduced. 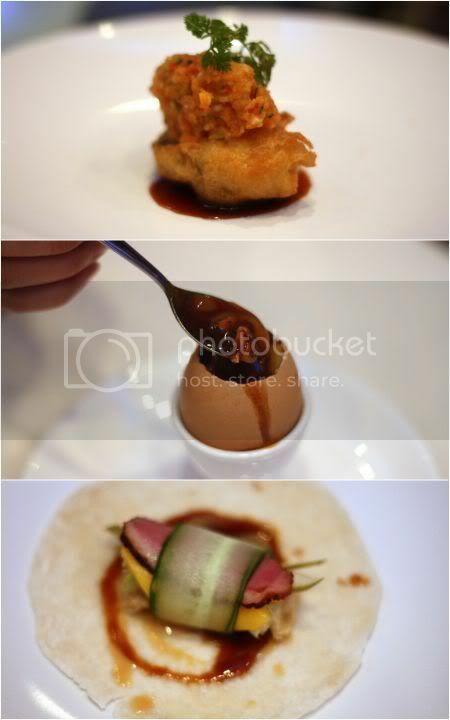 A classic Gu Yu Tien dish is the soft boiled egg topped with the decadent foie gras sauce. Yummy till the last drop and I was given the not very difficult task of finishing this. Last but not least, it was the mo mo duck roll - a lovely combination of pressed duck, sweet mango, hoisin sauce, mustard and spring onions. The 7-course set also comes with shark's fin soup, which is great value considering if you order this on an individual basis, it's about RM70 per person. 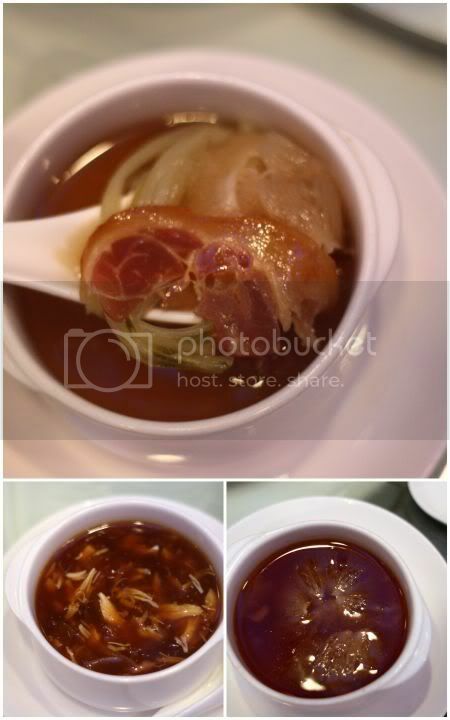 We were oohing and aahing over the prospect of a peppery pig stomach soup with shark's fin but instead we were blown away by the sweet and delicate flavours from the double boiled shark's fin soup with chin hua ham and dried cabbage. Simply good till the last drop! Looks are often deceiving hence when you see the simple grilled fresh water eel slices served with avocado mousse on the side, you'll brush the avocado portion as just decoration or even something just on the side. Combine the two items in your mouth and you get an explosion of flavours - smooth avocado with a tangy tone from blended pickled green chillies and the melt-in-the-mouth texture. Brings to mind, how avocado can be paired with the most unlikely things like the fried tempura avocado with pan-fried foie gras served in Sage that also blew me away. 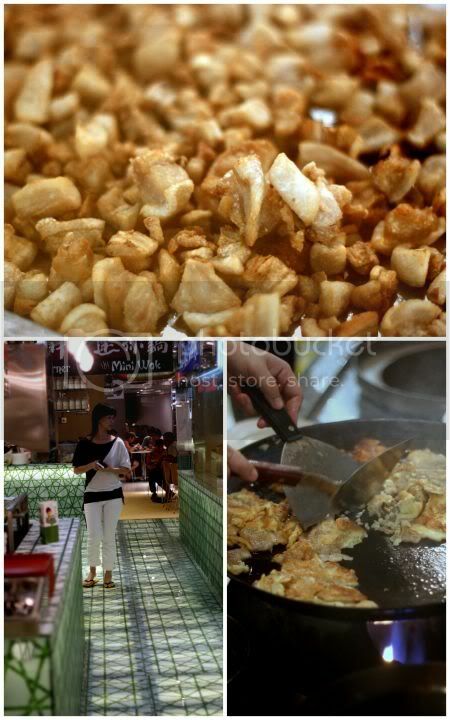 Another item within that RM99++ per person and also the 4-person set for RM268++ is the wok fried pineapple prawn cake. 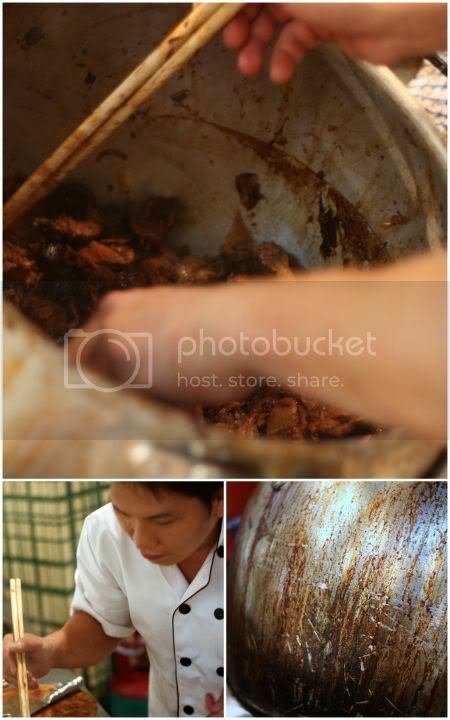 The moment the plate is placed in front, you'll be hit with the aromas from the bacon and jackfruit used within. The prawn cake is stacked high on top of sliced red cabbage with strawberries and a light creamy sauce that tastes so good with the bacon. 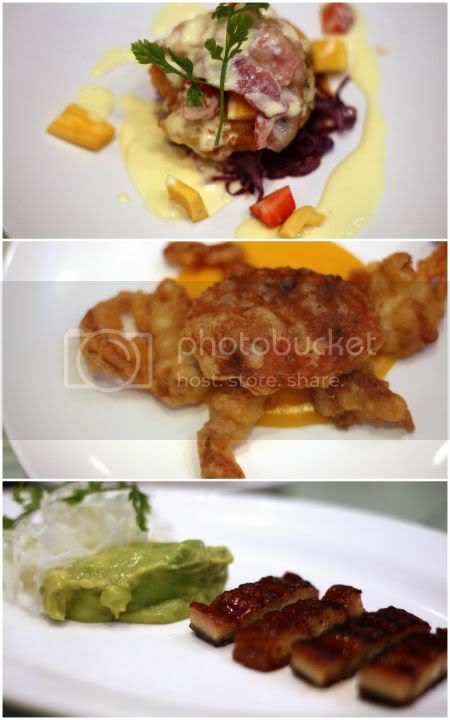 The other item within the set is the light and crispy soft shell crab paired with a slightly saltish pumpkin creme. 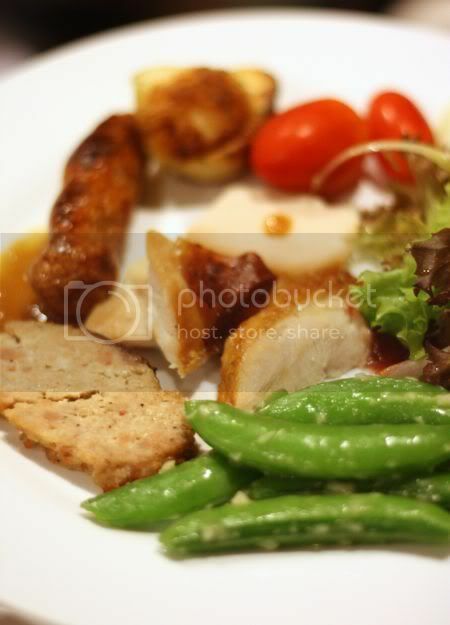 We're all groaning from all the food but when the tender slices of meat is placed in front of us, we can't resist. 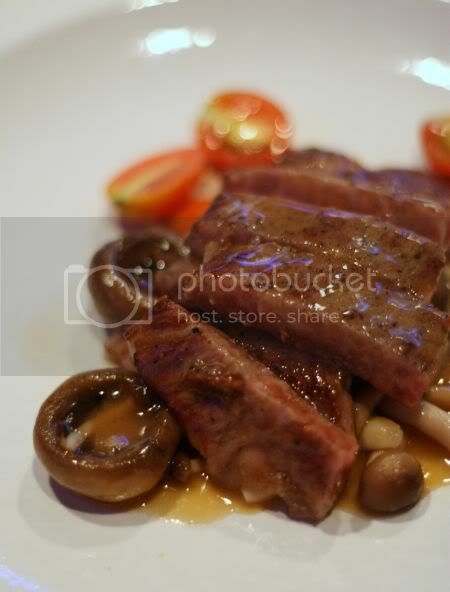 Everything is so good, I can's decide between the tender black pig served with the unusual wasabi soy sauce with butter or the wok charred lamb rack (beats a fine dining restaurant with its melt-in-the-mouth texure) or the sirloin topped with a generous portion of mushrooms. Even noodles and rice is elevated to the higher ground with Gu Yu Tien's versions. I loved the Hainan noodles - thick yellow noodles served with a thickish broth that got its soury tang from sliced pineapples, pickled onions and chillies that you don't need to add any extra vinegar. 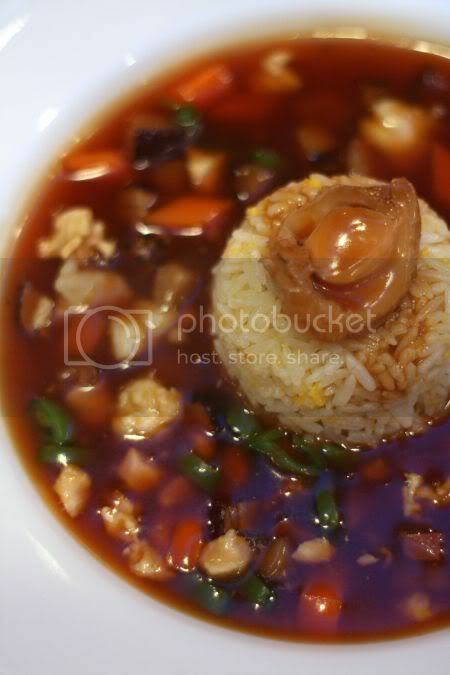 Braised rice is not something new and comforting like the braised eggy sauce served with seafood and rice. However, the ultimate comfort food must be the braised abalone rice, served with a very aromatic sauce made from abalone sauce, smoked tea duck and chopped vegetables. Utterly sublime stuff. 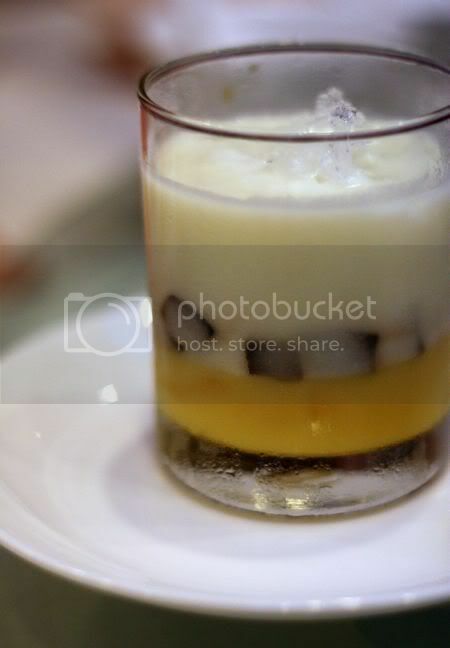 Last but not least its the dessert course - the unusual pairing of bittergourd pudding or the light tasting mango pudding topped with grass jelly cubes that makes a refreshing end to a very good meal. Avocado cream is also served in this selection that I found a little too sweet for my liking. I thoroughly enjoyed myself and vowed to come back to try the dishes again as they're all so incredibly good with unusual flavour pairings. For those who wish to see the full menu, please click on this link for the information on the various courses. More pictures of each of the courses and what we ate the last time my family had dinner is also found in the Flickr set. *Notice: The reviewer declares that part of this review was by invitation from the restaurant.